Advanced Speaker 27 – Spanish Spanish or Latin American Spanish? Let me start by saying that this subject is a highly polemic and controversial one. Making a blog and a podcast on this is like throwing a lighted match into a powder keg. Already, we have a small battle waging in the comments area in Youtube about what we say in the video. It seems that for every person who has something to say on this issue, there is a different opinion. Maybe I’m misreading the situation a little, but as far as I can see, there exists a fairly deep seated grudge held by the people of Central and South America against the Spanish which dates back to the Spanish conquest of their continents. Of course, the Spanish that committed those atrocities are long gone, yet the negative sentiment toward them still persists and perhaps always will. Is there much difference between the continents? The answer to that is yes and no. In essence they all use the same language as a basis for their communication. What differs are the accents, some grammatical features and the most important factor of all and one that truly divides each country, the idiomatic expressions and slang. I sat with Cynthia one time to watch a film called “Maríia llena de gracia.” a story of a Colombian girl who gets drawn into drug smuggling. I have to say that I struggled terribly to understand the dialogue and a number of times I had to ask Cynthia for help with what they were saying. What was surprising to me was that most times she said that she didn’t have a clue! I initially began learning Spanish in Mexico and liked very much the SESEO sound that they used. The Spanish CECEO seemed brutal and coarse at the time and I wasn’t a great fan of it. Yet, after meeting Cynthia and immersing myself into the Spanish culture I soon adopted their accent and grew to really like the expressive tonality of Spanish Spanish. It’s sad that so many people can become so obsessed with the correctness of one accent over another and allow it, when taken to the extreme, to create barriers and prejudices between people. When we made this podcast, we really thought that we were being very fair and comprehensive in our approach to the subject. However, there have been some that have criticised what we’ve said, claiming that we are supporters of the Spanish Spanish and that our podcast is pro-mainland Spanish, which couldn’t be further from the truth. Listen in and decide for yourself if the advice we offer is balanced or not. Have fun! Advanced Speaker 27 - Spanish Spanish or Latin American Spanish? Gordon Smith and Cynthia Durán make up the team LightSpeed Spanish. 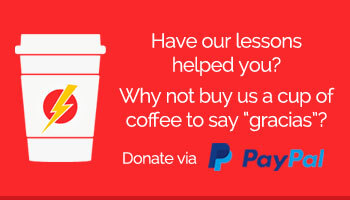 They've been helping students learn Spanish for over ten years. And everything that they've learned about teaching the language is here on this website. Sign up for our free welcome pack and to receive our regular newsletters.